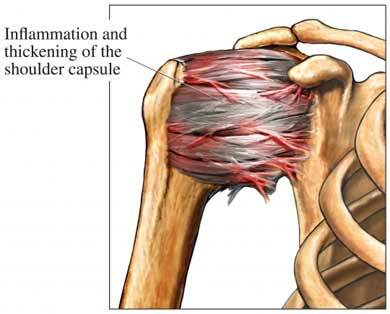 Adhesive capsulitis is a tightening in the shoulder joint. It decreases the range of motion in the shoulder and causes pain. This condition is also known as frozen shoulder . It is caused by tightening of the soft tissue and formation of scar tissue. If told to do so by your doctor, on the day of the surgery, shower using a special antibacterial soap. Do not use deodorant. General anesthesia will most likely be used. You will be asleep during the procedure. Three small incisions will be made in your shoulder. A special tool called an arthroscope will be inserted. An arthroscope is a flexible tube with a light at the end and a camera attached. This will allow the doctor to view the inside of the shoulder on a screen. Tiny instruments will be inserted into the other incisions. The doctor will then cut and remove scar tissue. The incisions will be closed with stitches. You will be taken to a recovery room after surgery. You will be monitored for any adverse reactions to surgery or anesthesia. If there are no complications, it may be possible to leave the hospital on the same day. Talk to your doctor to see if this is an option in your case. Your shoulder will be sore for a few weeks. It can take 3-6 months to fully recover. Use a sling if told to do so by your doctor. You may not need to use one, because it can cause stiffness. Work with a physical therapist at home to focus on range-of-motion exercises. Adhesive capsulitis of shoulder. EBSCO DynaMed Plus website. Available at: http://www.dynamed.com/topics/dmp~AN~T113935/Adhesive-capsulitis-of-shoulder . Updated December 22, 2015. Accessed November 10, 2017. Adhesive capsulitis (frozen shoulder). Palo Alto Medical Foundation website. Available at: http://www.pamf.org/sports/king/adhesive%5Fcaps.html. Accessed November 10, 2017. Examination under anesthesia. University of Washington Orthopaedics and Sports Medicine website. Available at: http://www.orthop.washington.edu/?q=patient-care/articles/shoulder/examination-under-anesthesia.html. Updated February 4, 2013. Accessed November 10, 2017. Frozen shoulder. Ortho Info—American Academy of Orthopaedic Surgeons website. Available at: http://orthoinfo.aaos.org/topic.cfm?topic=A00071. Updated January 2011. Accessed November 10, 2017. Shoulder arthroscopy. Ortho Info—American Academy of Orthopaedic Surgeons website. Available at: http://orthoinfo.aaos.org/topic.cfm?topic=A00589. April 2011. Accessed November 10, 2017. Shoulder surgery. Ortho Info—American Academy of Orthopaedic Surgeons website. Available at: http://orthoinfo.aaos.org/topic.cfm?topic=A00066. Updated August 2009. Accessed November 10, 2017.